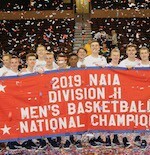 For the third time in five years, Indiana Wesleyan wins the NAIA Division II Men's Basketball National Championship. The Wildcats held off a valiant comeback by Crossroads League rival University of Saint Francis (Ind.) 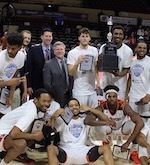 to defeat the Cougars 84-71 in the 2018 title game played at the Sanford Pentagon in Sioux Falls, S.D. Sioux Falls, S.D. Freshman guard Kyle Mangas (6'3''-G) was sensational on the biggest stage, scoring 23 points to go with four rebounds and three assists, on his way to being named the championship's most outstanding player. Evan Maxwell, the Wildcats 6'10 big man, netted 20 points, including a clutch three-pointer to put his team up six with just under four minutes left. Another freshman, Grant Smith (6'6''-F), contributed 11 of his 13 points in the second half, scoring a key three-point play in the final minutes. Indiana Wesleyan opened the second half with the first six points to match its largest lead, 46-29, after two free throws by Canaan Coffey. With the game in balance, Saint Francis looked to seniors Derek Hinen, Evan Henry and Bryce Lienhoop, who combined to score 17 of their teams next 21 points in a 21-5 surge to cut the IWU lead down to one, 51-50, at the 10:40 mark. With Indiana Wesleyan still up one (62-61), Mangas and Maxwell combined for all nine points of a 9-2 run that put the Wildcats up by eight. Henry knocked down a three-pointer for USF to get within five (73-68) but the game would not get any closer. Following a timeout, Smith converted a three-point play and IWU iced the game from the free-throw line, going 8-for-8 over the final 1:15. Indiana Wesleyan shot better than 50% in both halves, finishing at 55% and 40% (8/20) from the three-point line. Both Jacob Johnson (14) and Coffey (12) gave the Wildcats five players in double figures. Hinen scored a game-high 24 points to lead Saint Francis, 19 coming in the second half. Lienhoop tallied 17 points and nine rebounds in his final game with the Cougars, who shot 45% for the game. Saint Francis held its last lead (15-13) after Chandler White and Hinen hit back-to-back three-pointers with 12 minutes to go in the first half. Following a media timeout, Indiana Wesleyan went on a 12-0 run, holding the Cougars scoreless for over four minutes, to take the lead for good. A pair of three-pointers by Coffey and another by Mangas keyed an 11-4 surge, putting IWU up 36-19, moments later. USF was able to close the gap to 11 by halftime, getting six points from Lienhoop over the final three minutes. Saint Francis ends the season with a 29-9 record and is now 1-3 in championship games. Indiana Wesleyan earned its fourth win of the season over Saint Francis and closes the season with a 31-7 record. The Wildcats also won the title in 2014 and 2016 and are now tied with Cornerstone (Mich.) and Oregon Tech for the most championships at the D-II event.